Into a mixing bowl, add the lime juice, the hot sauce, the garlic, and the mayonnaise. Whisk until well blended. Taste and add sea salt, as desired. Add the shrimp, the hard cooked egg pieces, the parsley, and the scallions to the dressing. Fold all of the ingredients together. Taste again and add more sea salt and/or hot sauce to your liking. 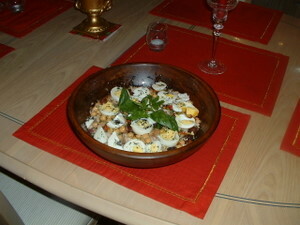 Place the tuna steaks, the oregano, the garlic, and the olive oil in a baking dish. Sprinkle a teaspoon of sea salt and 1/4 teaspoon of ground black pepper on the tuna steaks. Cover the tuna steaks with aluminum foil and roast them in the preheated oven for two hours. After two hours, remove the tuna steaks and let them cool. Retain the olive oil that the tuna was cooked in along with the garlic clove. Discard the oregano stalk. When cooled, remove the tuna steaks and flake them with a fork into bite sized pieces. Into a large mixing bowl, add the garlic clove (that was roasted with the tuna steaks), two teaspoons of sea salt, and 1/2 teaspoon of crushed red pepper flakes. Mash these ingredients with a fork to form a paste. Add the anchovy paste and mash again. Add the red wine vinegar and the lemon juice. Whisk all of the ingredients until well blended. While whisking, slowly drizzle in the olive oil (that was used to roast the tuna steaks in). After all of the olive oil has been added, continue to whisk the mixture until it is smooth and thickened slightly. Taste and add more sea salt and/or crushed red pepper flakes, if desired. Add the flaked tuna, the chick peas, the pine nuts, the currants, the chopped roasted red bell pepper, the kalamata olives, the capers, the celery, the red onion, the basil, and the parsley to the mixing bowl with the dressing. Mix well until all of the ingredients are well incorporated. Slice the hard cooked eggs into circles and place them on top of the salad. In a mixing bowl, mix together the chopped squid tentacles, the bread crumbs, the garlic, the grated cheese, the parsley, the currants, the pine nuts, 1/2 teaspoon of sea salt, and the crushed red pepper flakes. Mix well. Add the beaten egg and mix until the mixture takes on a paste-like consistency. Stuff each squid tube about 3/4 full with the bread crumb mixture. Seal the open end of each squid tube with a toothpick. Season the outside of each squid tube with sea salt and ground black pepper. Place one cup of the marinara sauce in a baking dish and spread the sauce out so that the bottom of the dish is coated evenly. 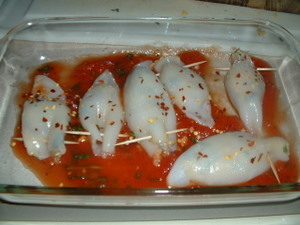 Place the squid tubes on top of the sauce in the baking dish. Top the squid tubes uniformly with the remainder of the sauce. Bake in a preheated oven set at 350 degrees for one hour. Into a sauce pan, add the butter, 1/4 teaspoon of ground black pepper, 1/4 teaspoon of sea salt, the lemon juice, and the garlic. Place the pan on low heat. While stirring, heat the ingredients until the butter melts. As soon as the butter is melted, take the pan off of the heat. Add the bread crumbs to the sauce pan and mix well so that the bread crumbs get moistened with the butter and the lemon juice. Brush a sheet pan with olive oil or apply cooking spray to the pan. 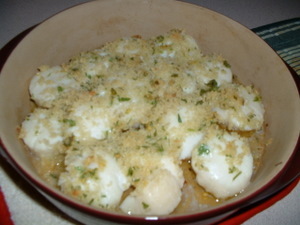 Sprinkle 1/4 teaspoon of sea salt and 1/4 teaspoon of ground black pepper on the lobster tails, the scallops, and the shrimp. Place the seafood on the sheet pan allowing space in between each piece. 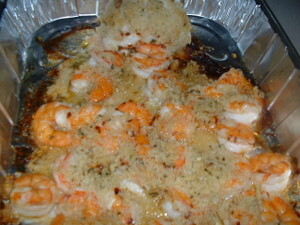 Put a thin layer of the bread crumb mixture uniformly on top of each piece of seafood. Bake in the preheated oven for 40 minutes or until the bread crumbs are golden brown. Into a small pot, add the water, the arborio rice, and a teaspoon of sea salt. Place the pot on high heat and bring the contents to a boil. When the boiling point is reached, turn the heat down to low. Cover and simmer the rice and the water for about twenty minutes until the rice absorbs all of the water. Remove the cooked rice from the heat and fluff it with a fork. Let the rice cool. Into a saute pan, add the pancetta and a tablespoon of olive oil. Cook on medium low heat until the pancetta becomes crispy. Add the onion, the garlic, 1/2 teaspoon of sea salt, and the ground black pepper. Cook on medium heat stirring frequently for three minutes. Take the pan off of the heat. Into a mixing bowl, add the cooked rice, two tablespoons of the grated cheese, the peas, the parsley, the onions, the pancetta, and the garlic with all of the pan drippings. Mix well. Add the beaten egg and mix again. Apply cooking spray to the pie pan or brush the pie pan lightly with olive oil. Add the rice mixture to the pie pan and spread it out evenly. 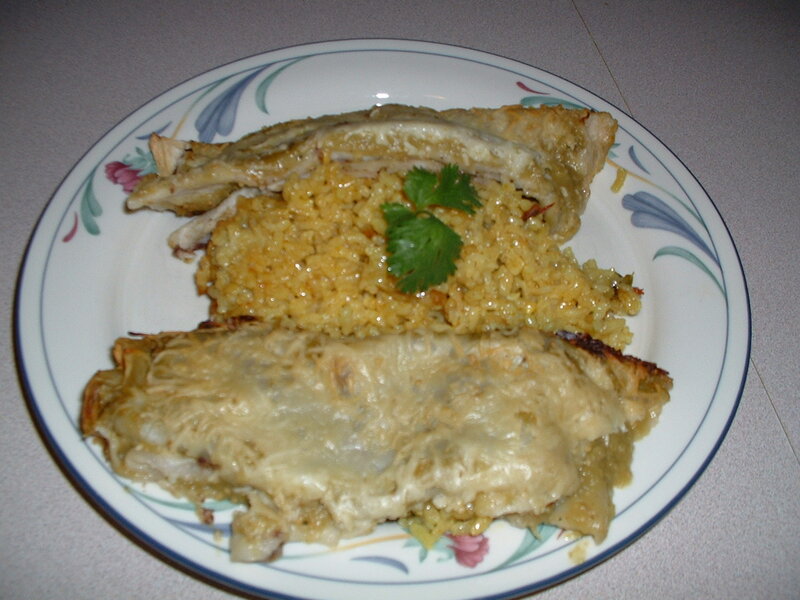 Sprinkle the bread crumbs and two tablespoons of the grated cheese uniformly over the rice. Drizzle the bread crumbs and the cheese with about a tablespoon of olive oil to moisten. Bake in the preheated oven for 40 minutes until the top is golden brown. Into a large pot, add the water, the apple juice concentrate, the sea salt, the brown sugar, the onion, the peppercorns, the mustard seeds, the thyme, and the bay leaf. Bring the mixture to a boil stirring frequently. After the boiling point is reached, turn the heat off. Let the brine sit until it reaches room temperature. After the brining liquid reaches room temperature, place the pork roast into the brine and weigh it down with a plate. Place the pot with the brine and the pork into the refrigerator for at least 24 hours. After at least 24 hours have passed, remove the pork roast from the brine and pat it down thoroughly with a paper towel. Place the pork roast in a roasting pan and put it into an oven that has been preheated to 350 degrees. 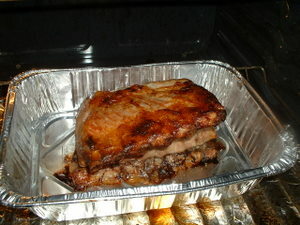 Roast the pork for two hours or until an internal temperature of 140 degrees is achieved. Note: because of the sugar in the brining liquid, the pork may start to turn dark brown during the roasting process. If this happens, just cover the roast with aluminum foil. Let the meat rest for at least 10 minutes before carving. When carving, cut the roast into chops by following the rib bones with your knife. Serve with apple sauce. Into a 12-14 inch saute pan, add the pancetta and two tablespoons of olive oil. Cook on low heat for 5-7 minutes until the pancetta becomes crispy. Add the onions and the garlic. Cook while stirring frequently for three minutes. Turn off the heat. Set the pancetta, onion and garlic mixture aside making sure to retain all of the pan drippings. 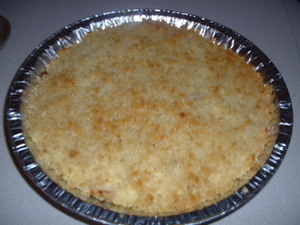 Rub a 10 1/2 inch wide by 2 inch deep pie pan with unsalted butter or olive oil. Into a mixing bowl, add the boiled potatoes, the grated cheese, the half and half, the onions, the pancetta and the garlic (with all of the pan drippings). Mash the potatoes until smooth and mix well so that all of the ingredients are incorporated. Taste and add salt and pepper, as needed. Add the beaten egg. Mix again. Add the potato mixture to the pie pan and spread it out evenly. 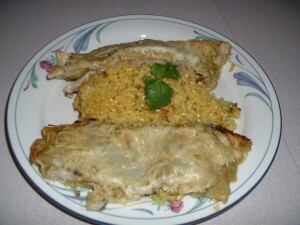 Sprinkle the bread crumbs and a 1/4 cup of the grated cheese uniformly over the top. Drizzle the top with two tablespoons of olive oil. Bake in the oven for 40 minutes until the top turns golden brown. Into a salad serving bowl, add the garlic, the red onion, 1/4 teaspoon of sea salt, and the black pepper. Mash with a fork until a paste is formed. Add the the anchovy paste and the Dijon mustard. Mash again. Add the lemon juice and the red wine vinegar. Whisk the mixture until smooth. While whisking, slowly drizzle in the olive oil. 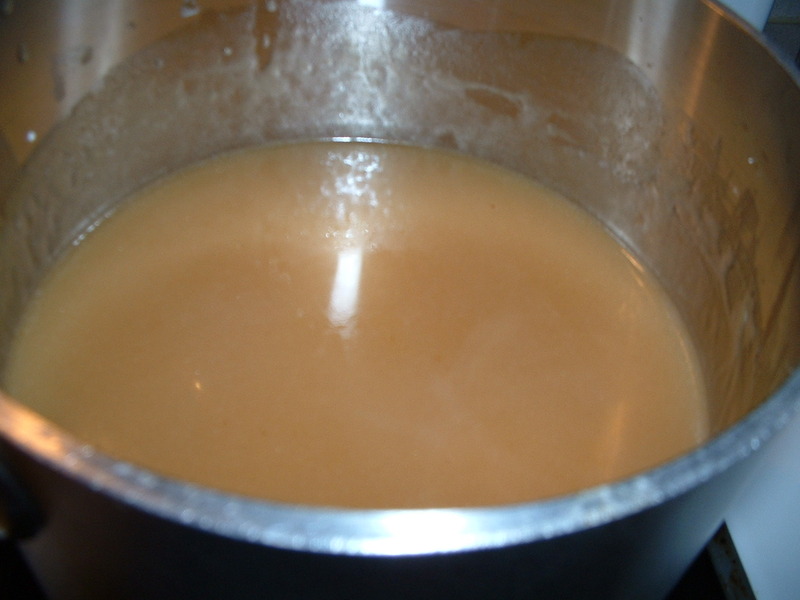 Continue to whisk until the dressing is well blended and thickened slightly. Taste and add more sea salt and/or pepper, as needed. Add two teaspoons of sea salt to a pot of cold water. Note: the pot should be large enough to accomodate the green beans. The water level should barely cover the green beans. Bring the water to a boil. After the water reaches the boiling point, add the green beans to the boiling water. Cook the green beans for three to four minutes until the beans are tender. Drain the beans well in a colander. While the beans are still hot, add them to the salad serving bowl with the dressing. Mix gently so that all of the beans get coated with the vinaigrette dressing. 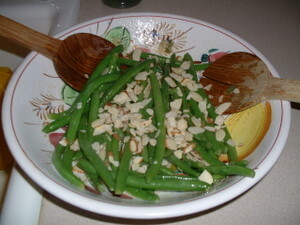 Top the green beans with the sliced almonds and serve. Add two tablespoons of sea salt to a pot of cold water large enough to accomodate the kale. Bring the water to a boil. Cook the kale in the boiling, salted water for three minutes. Drain the greens and then squeeze out as much water from the kale as you can. Set aside. Put the olive oil in a large skillet on medium heat. Add the onions, the crushed red pepper flakes, and a teaspoon of sea salt to the olive oil and cook the onions for 4 minutes stirring frequently. Add the garlic and cook for an additional minute. Add the greens. Stir so that the greens get coated with the olive oil, the onions, and the garlic. Taste and add more sea salt and/or crushed red pepper flakes, if necessary. Remove from the heat and let cool. 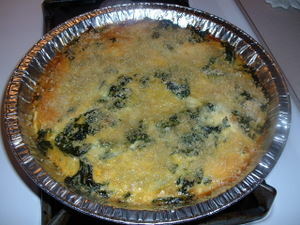 In a greased baking dish, add the kale and spread it out evenly on the bottom of the dish. Add the beaten eggs and smooth them out uniformly over the top of the greens. Sprinkle the bread crumbs and the grated cheese evenly over the top of the eggs. Bake at 350 degrees for 35 to 40 minutes until the top becomes golden brown. Into a large mixing bowl, add the cut yams and the olive oil. Mix well so that the potatoes get coated with the olive oil. Add the sea salt, the chili powder, and the cayenne pepper. Mix again to coat the yams well with the dried spices. 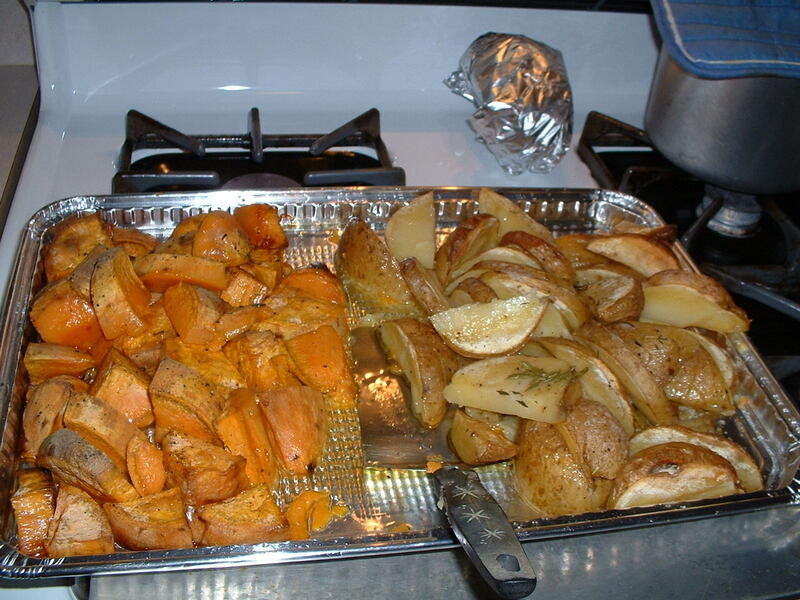 Spread the yams out evenly on a baking sheet that has been coated with cooking spray. Roast in the preheated oven for one hour or until the potatoes are browned. Serve with ketchup or ranch dressing. 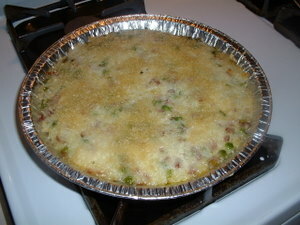 This is a classic holiday side dish that can be made well in advance and refrigerated. Into a sauce pot, add the butter and the flour. Cook on medium heat while whisking. When the butter has melted and is combined with the flour, slowly add the chicken stock. Continue to whisk until the mixture bubbles slightly. At this point, the gravy will thicken. Turn the heat down to low. Simmer the mixture on low heat while stirring frequently for 4 minutes. Turn off the heat. Taste and add sea salt and black pepper to taste. Set the gravy aside. Add two teaspoons of sea salt to a pot of boiling water. Place the green beans into the boiling water. Remove the green beans after 4 minutes. Drain the beans well in a colander. Heat a 12-14 inch skillet on medium high heat for 4 minutes. 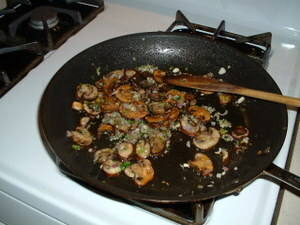 Add a tablespoon of olive oil and the mushrooms to the skillet. Spread the mushroom slices out evenly in the pan. Let the mushrooms cook without touching them for 6 minutes. After 6 minutes, add the garlic, the red onion, the celery,the rosemary, the thyme, the parsley, 3/4 teaspoon of ground black pepper, and 3/4 teaspoon of sea salt to the mushrooms. Stir well to incorporate all of the ingredients. Turn the heat off. 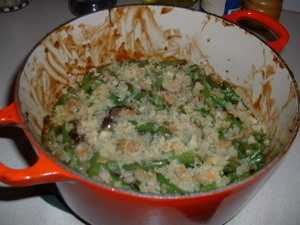 Put the green beans into a round casserole dish. Add the mushroom mixture and the gravy. Mix well. Add two tablespoons of olive oil to the breadcrumbs in a seperate dish. Stir well so that the breadcrumbs become moistened with the olive oil. Add the breadcrumb and the olive oil mixture to the top of the green beans. Spread the breadcrumbs out evenly over the green beans. Cover and bake in a preheated oven at 350 degrees for 40 minutes. Leave uncovered for the last 15 minutes so that the breadcrumbs become brown on top. Add the canola oil to a 12-14 inch skillet. Put the skillet on medium high heat for three minutes. 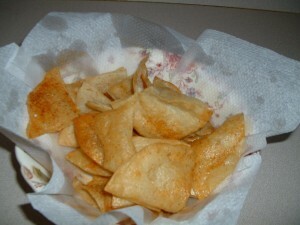 Fry the tortillas in batches in the hot oil for about 1 1/2 minutes on each side until crispy. Be careful not to crowd the skillet with tortillas when frying them. After frying, place the tortillas on a paper towel to drain. 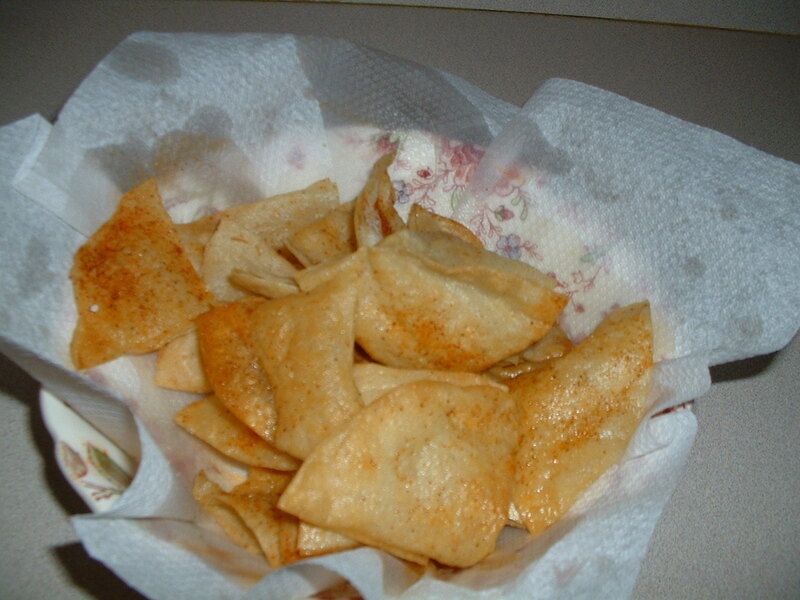 Season the tortillas while they are hot with sea salt, chili powder, and cayenne pepper. Note: Save the frying oil for use at a later date. Into a three inch deep, 12-14 inch wide sauce pan, add the olive oil. Heat the olive oil on medium high for 4 minutes. Sprinkle the zucchini with sea salt and ground black pepper. 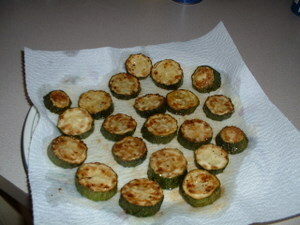 Place the zucchini slices into the hot oil. Cook the zucchini until brown on both sides. Place the zucchini on a paper towel to drain. Retain the olive oil left in the pan. Cook the ziti in a pot of salted, boiling water according to the package instructions. Drain the ziti in a colander. Put the pan with the olive oil on medium heat. Add the capers, the garlic, the lemon, a pinch of sea salt, and a pinch of ground black pepper. Cook while stirring for two minutes. Scrape up any of the brown bits that have accumulated on the bottom of the pan. 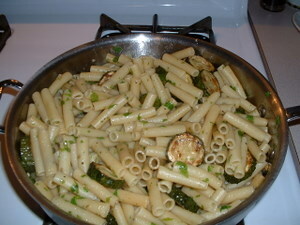 Add the ziti and the parsley. Cook the pasta while stirring for three minutes. Add the fried zucchini. Cook for an additional minute. Turn off the heat. Prepare the salsa verde and the refried beans first. You can even make them the day before and refrigerate. Brush the tomatillos with canola oil and sprinkle them with salt and black pepper. Place the tomatillos on a sheet pan. Place the garlic, the onion, the jalapeno pepper, and the poblano peppers on a sheet of aluminum foil and brush these vegetables with canola oil. Sprinkle them with sea salt and black pepper. Wrap the vegetables tightly with the sheet of aluminum foil. Place this packet of vegetables on the sheet pan with the tomatillos. Bake all of these vegetables in the preheated oven for 20 minutes until the tomatillos turn light brown. Remove the sheet pan from the oven and let the vegetables cool. After the vegetables have cooled, remove the stems from the peppers. Into a blender, add the peppers (minus the stems), the tomatillos, the onion, a teaspoon of sea salt, the cumin, the oregano, the honey, and the water. Squeeze the roasted flesh from the garlic cloves into the blender. Blend this mixture until smooth. Taste and add more sea salt and/or black pepper, if desired. Set the sauce aside. Into a pot, add the chicken broth, the black beans, the celery, the onion, the garlic, the sea salt, and the ground black pepper. Simmer the contents of this pot on low heat for 45 minutes. After 45 minutes, remove the liquid by draining the mixture in a colander. Place the solids into a food processor. Blend until smooth. Taste and add more sea salt and/or black pepper, if desired. Set the refried beans aside. Into a 12-14 inch non-stick saute pan, add the canola oil, the cayenne pepper, the sea salt, the red onion, and the garlic. Cook on medium heat for 5 minutes stirring frequently. Add the shrimp and stir so that the pieces of shrimp get coated with the onion, the garlic, and the spices. Continue to cook on medium heat while stirring frequently until the shrimp pieces turn pink in color. Add the corn. Cook for two more minutes while stirring. Turn off the heat and let the mixture cool. Wrap the tortillas with a damp paper towel and place them in the microwave oven on high heat for 1 1/2 minutes so that the tortillas become pliable. Spread two cups of the salsa verde out uniformly on the bottom of a casserole pan. Place about two tablespoons of the refried bean mixture onto a tortilla and spread it out evenly. Add about three tablespoons of the shrimp and corn mixture on top of the refried beans. Roll the tortilla up like a cigar. Place the filled tortilla in the baking pan on top of the salsa verde seam side down. Continue this process until all of the tortillas are filled and placed side-by-side in the casserole pan. Pour the remaining salsa verde on top of the filled tortillas and spread the sauce out equally over each one. Top the tortillas with the shredded monterey jack cheese. Cove the baking pan with aluminum foil. Bake in a preheated oven set at 350 degrees for 45 minutes. Into a Dutch oven, add the canola oil, the red onion, the garlic, the tomato, the cilantro, the jalapeno pepper, and the sea salt. Cook on medium high heat for 8 minutes stirring frequently. Add the rice. Stir so that the rice gets coated thoroughly with the vegetable mixture. Cook until the rice turns milky white. Add the chicken broth and the tumeric. Stir to incorporate all of the ingredients. Bring the mixture to a slight boil and then cover the pot. Place the pot in the oven and cook for 40 minutes until the rice has absorbed all of the liquid and is tender. 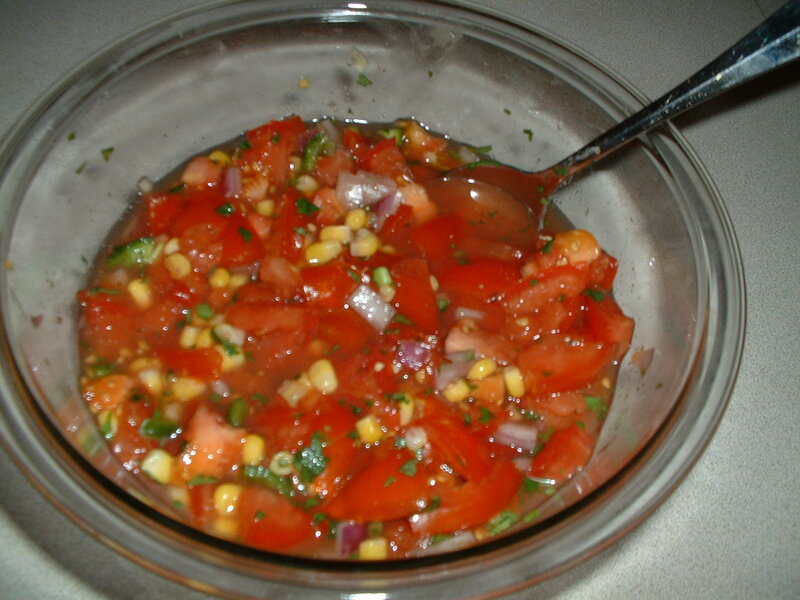 Into a mixing bowl, add the corn, the tomato, the jalapeno pepper, the red onion, the garlic, the cilantro, the sea salt. Mix well. Squeeze the lime juice on top of the vegetables. Mix again. Taste and add more sea salt, if desired. Into a pot (large enough to hold the turkey and 19 cups of liquid), add the water, the sea salt, the brown sugar, the orange concentrate, the onion, the black peppercorns, the mustard seeds, the thyme sprigs, and the bay leaf. Bring to a simmer on medium high heat stirring frequently. After the mixture reaches a slight boil, remove the pot from the heat and let the brine sit until it reaches room temperature. After the brine reaches room temperature, completely submerge the turkey in the brine and weigh the top of the turkey down with a plate. Wrap the top of the pot tightly with plastic wrap. Put the lid on the pot. Refrigerate the turkey and the brine for at least 24 hours. 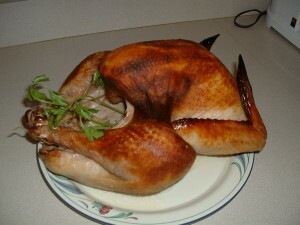 When you are ready to roast the turkey, preheat the oven to 350 degrees. Remove the turkey from the brine and pat it down thoroughly with paper towels. Place the turkey in a roasting pan. Cook the turkey in the preheated oven for 4 hours. Note: the brine will cause the turkey to darken in spots. When this begins to happen, cover the turkey with aluminum foil. Let the turkey rest for 20-30 minutes before carving. Retain the pan drippings for the gravy. Add one cup of chicken stock to the roasting pan that the turkey was roasted in. Put the pan on medium high heat. While cooking the liquid, scrape the bottom of the roasting pan to lift up the browned bits that have accumulated. After the browned bits have dissolved into the chicken broth, strain the liquid into a sauce pot. Put the sauce pot on medium heat. Add two tablespoons of corn starch. Whisk to dissolve the corn starch into the broth. Continue to whisk until the mixture begins to boil. The gravy will be at its full thickness when it comes to a boil. If you want thicker gravy, add more corn starch a little at a time. Taste the gravy and add salt and/or pepper, if desired. Keep the gravy warm on low heat until you are ready to serve it. Into a saute pan, add the canola oil, a teaspoon of sea salt, the celery, the red bell pepper, the red onion, the garlic, and the red cayenne pepper. Cook on medium heat for 5 minutes stirring occasionally. Turn off the heat and let the vegetables cool. With your hands, crumble the cornbread. Place the cornbread in a mixing bowl. Add the cooked vegetables, a teaspoon of sea salt, the creamed corn, the chicken broth, a pinch of ground black pepper, and the beaten egg. Mix the ingredients well. Note: the mixture should be loose. If it appears too thick, add some additional chicken broth or water. Spray a round, deep baking dish with cooking spray. 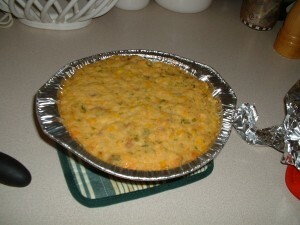 Add the cornbread mixture to the baking dish and spread it out evenly. Bake in the preheated oven for 40 minutes until the dressing is golden brown on top. Into a mixing bowl (large enough to accomodate 1 1/2 pounds of yams), add the yams and the olive oil. Mix well until all of the yam cubes are coated with the olive oil. Note: add more olive oil if necessary. Add the sea salt and ground black pepper. Mix well. Arrange the yams in a single layer on a sheet pan that has been sprayed with cooking spray. 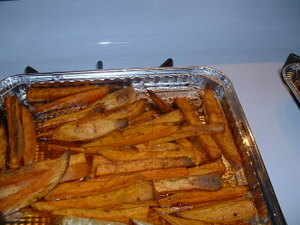 Roast the yams for 50-60 minutes until the potatoes are lightly browned.